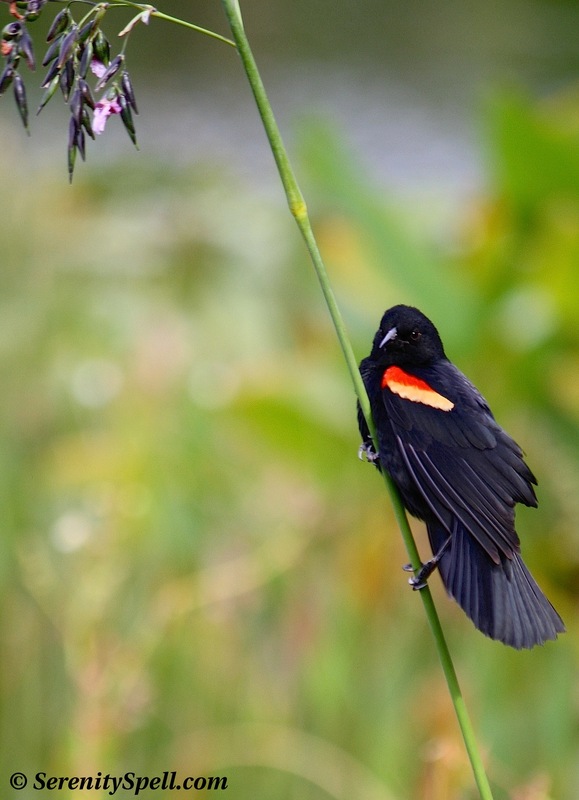 Red-winged Blackbirds are found in most of North and much of Central America, and are familiar sights in our wetlands. 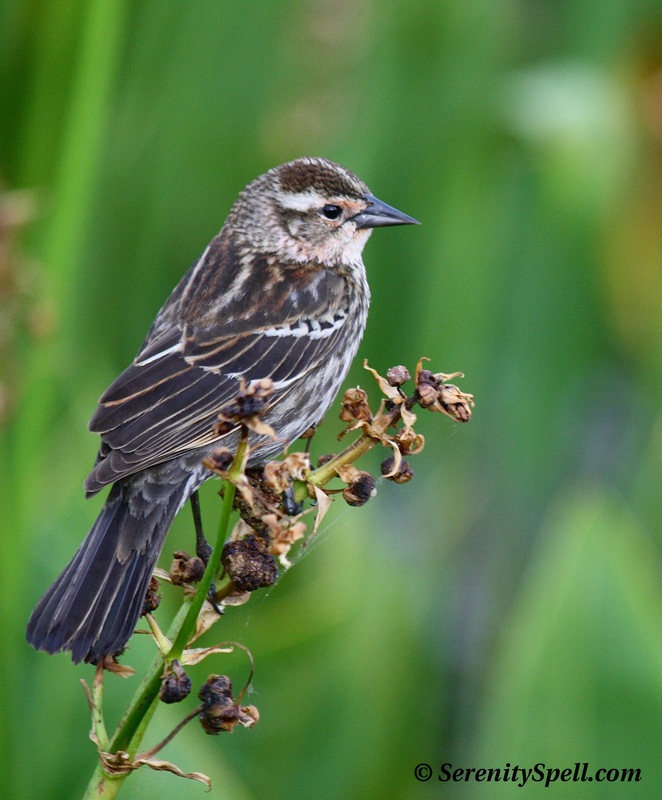 There have been claims that it is the most abundant, and most well studied bird in North America. 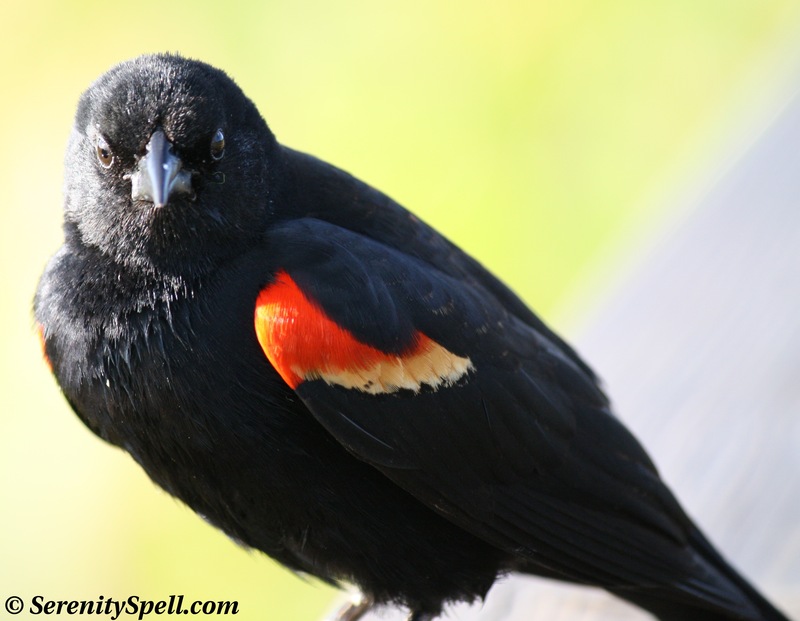 The males, glossy black with scarlet-and-yellow shoulder patches, puff up or hide depending on their level of confidence. 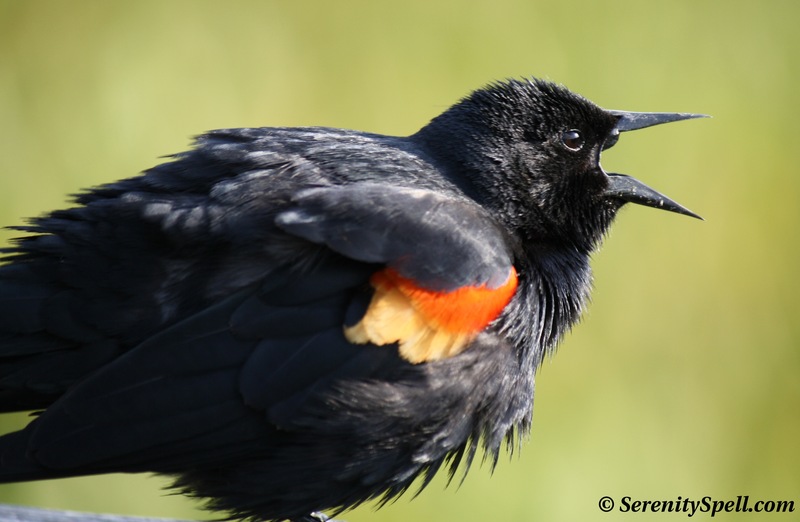 In our marshes, they’re quite brave (or protective, in defense-mode), doing as much as they can to get noticed, and belting out their conk-la-ree songs. 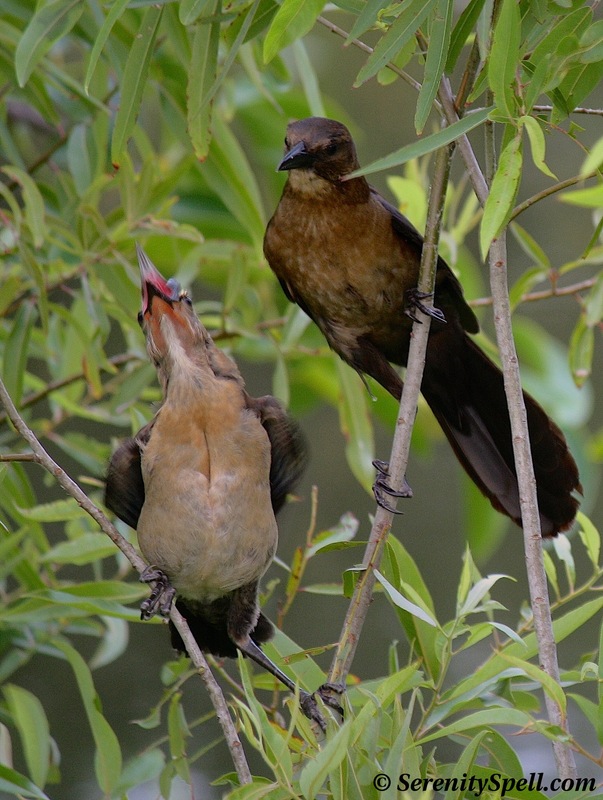 The female is a subdued brown, with streaks of lighter colorations — and much shyer than her male counterpart. 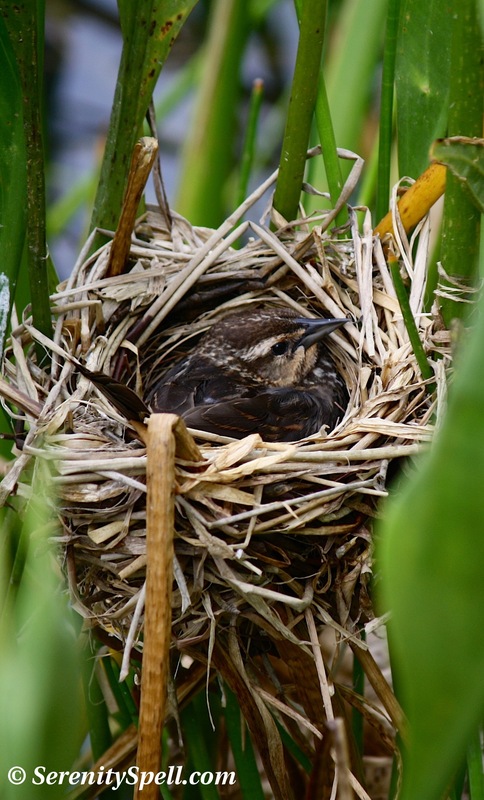 Her brownish coloring serves to camouflage her and the nest, while she’s incubating. 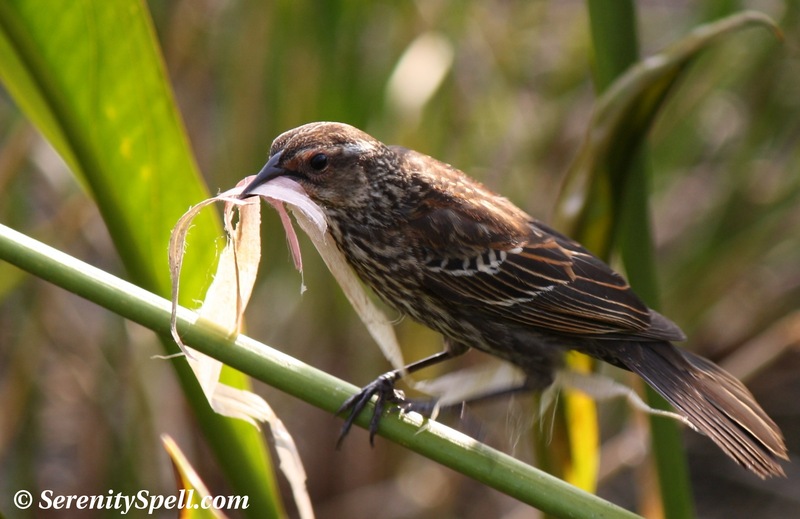 Females stay low in the vegetation, searching for food (eating primarily seeds and insects), and weaving their amazing nests. 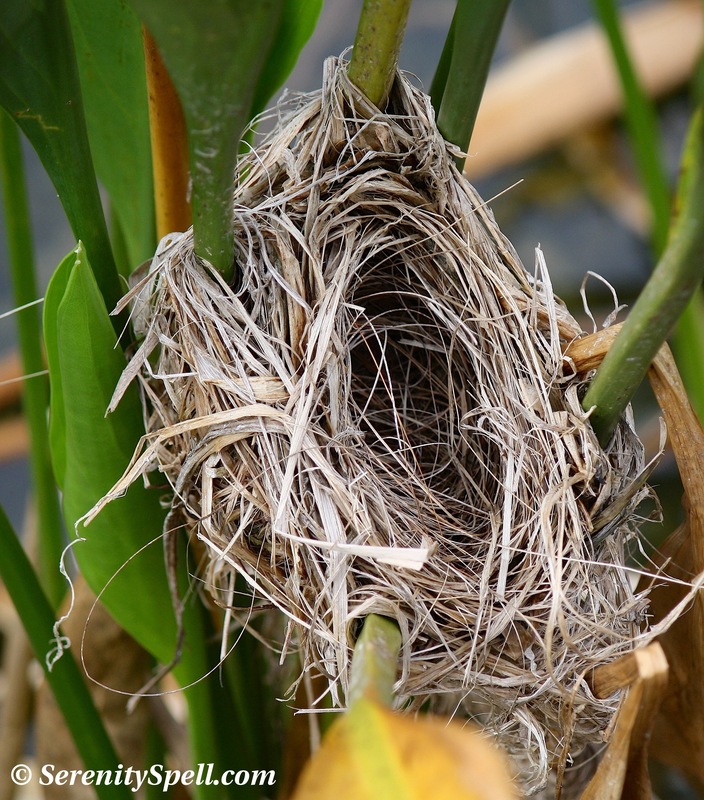 Constructed entirely over the course of three to six days — with no help from the males — the nests are located in cattails, rushes, grasses, or in alder or willow bushes. 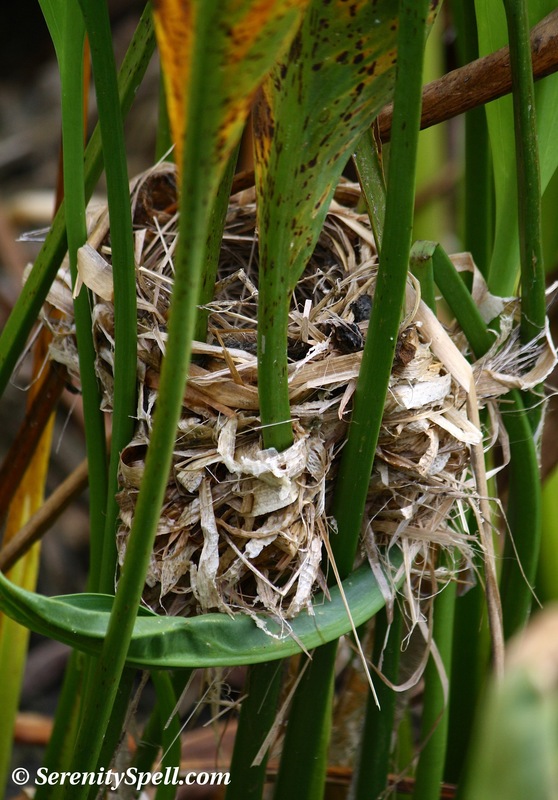 Located near the water’s surface, the nest is a basket constructed of grasses, sedge, and mosses, lined with mud and bound to surrounding grasses or branches. 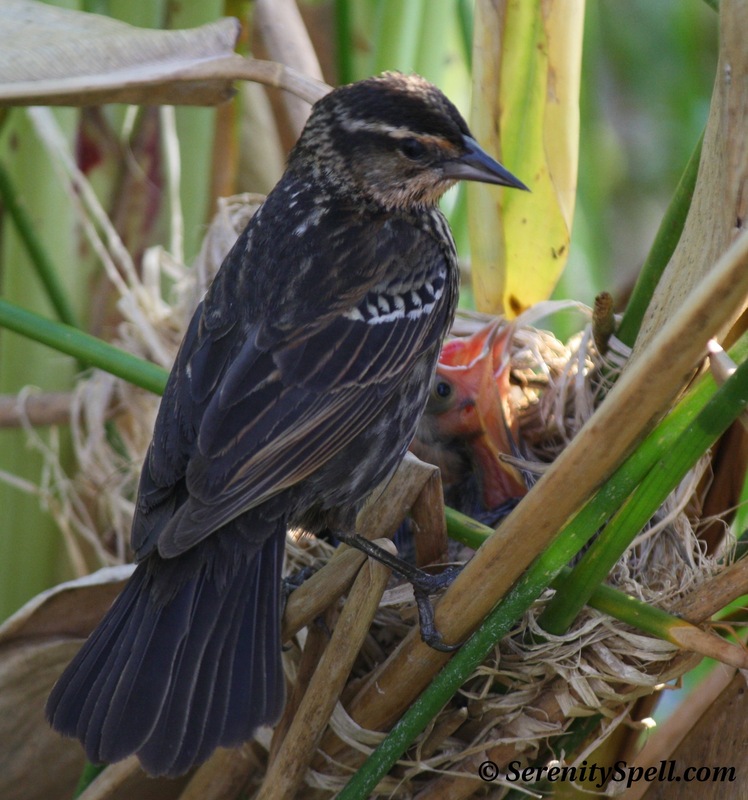 I’ve watched for nearly an hour in awe, as a female patiently gathered her grasses — and even longer as another intricately wove her basket-nest. 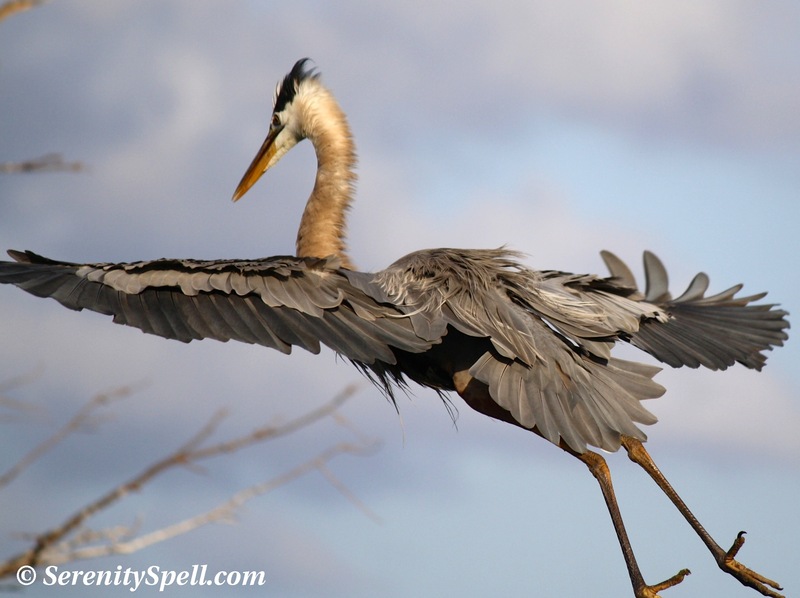 It’s beautifully mesmerizing (and believe me, I’m no birdwatching crackerjack!). 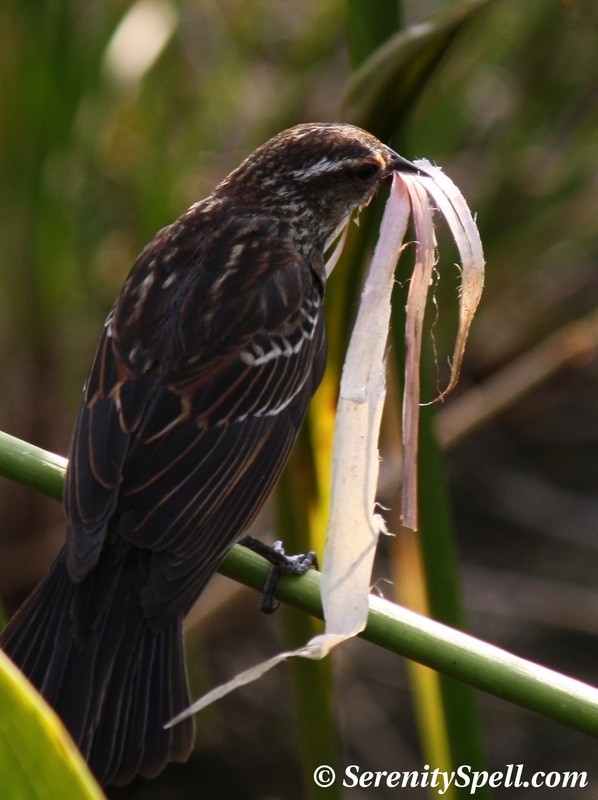 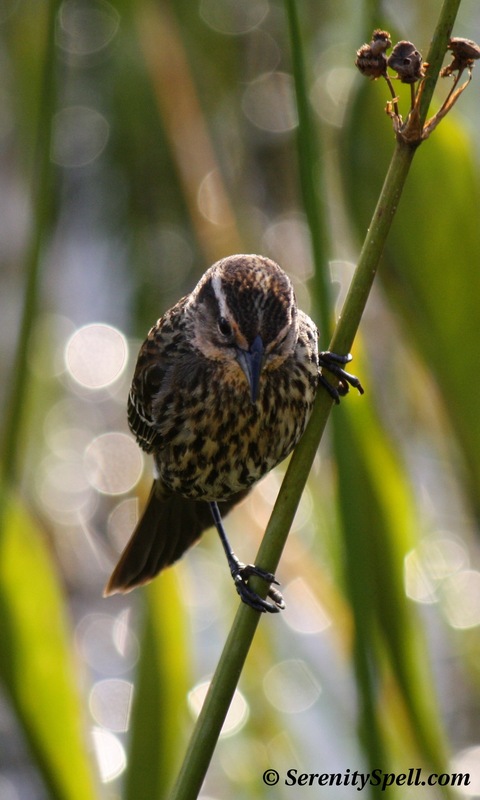 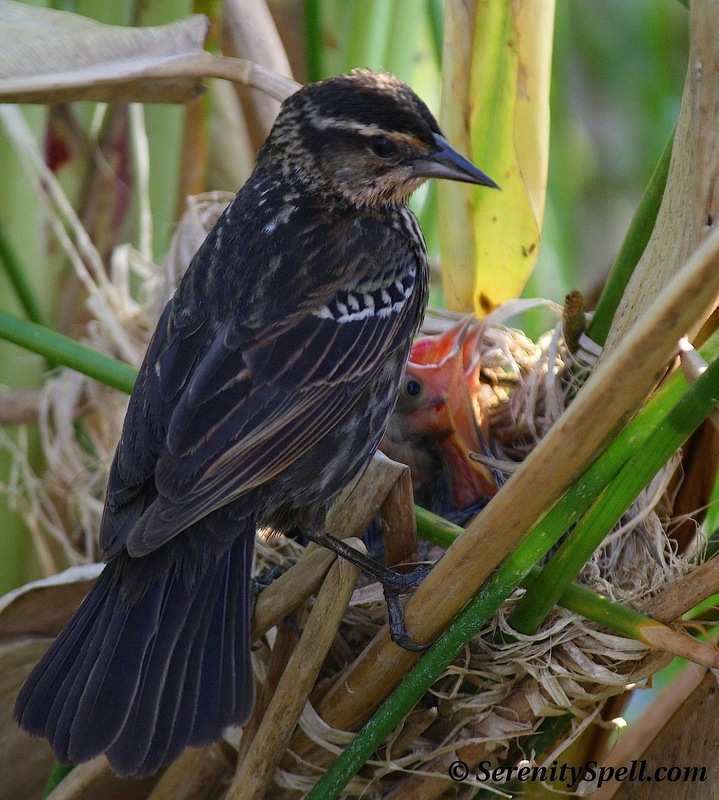 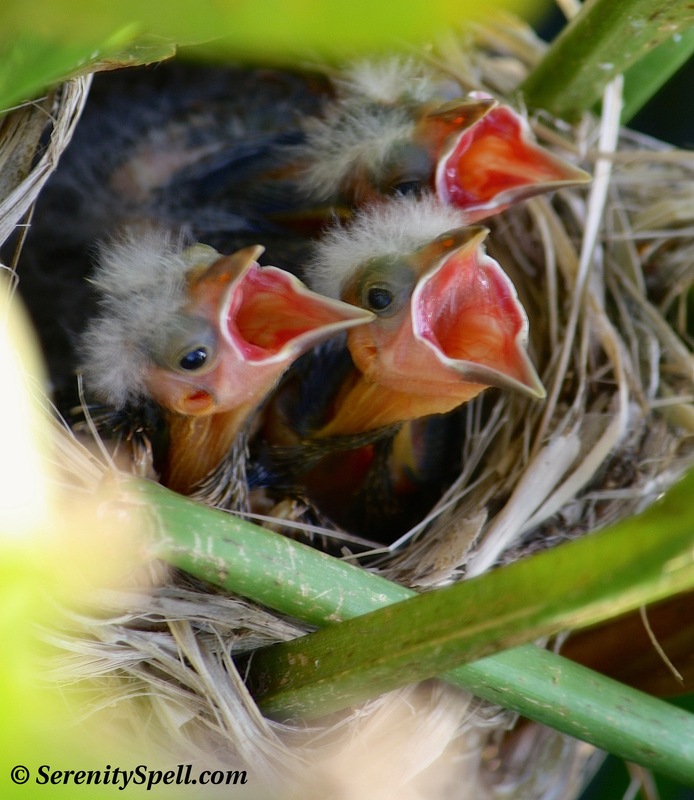 Red-winged Blackbirds nest in loose colonies, and their predators include snakes, raccoons, and other birds, even the small marsh wrens — and in our area, iguanas. 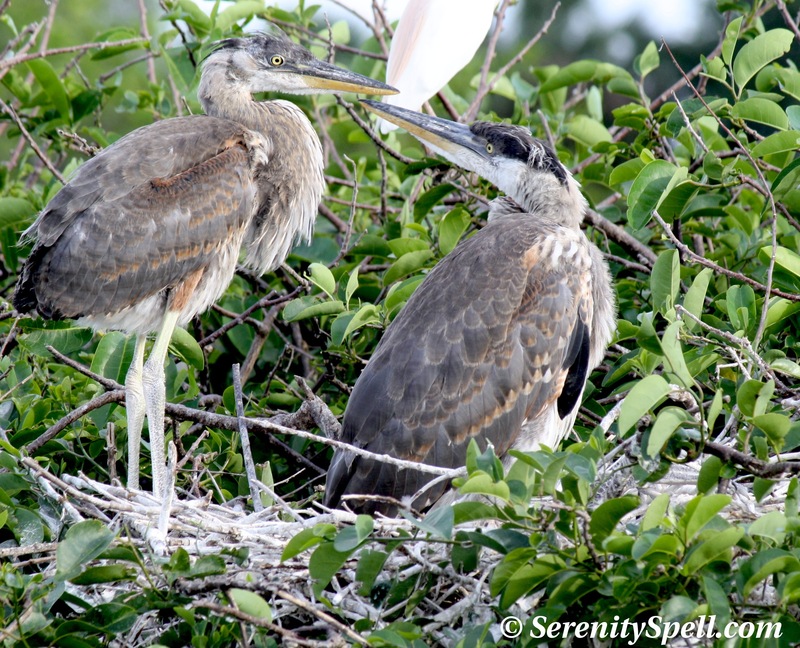 Males serve as sentinels to guard the nest, using various calls to denote the type and severity of danger. 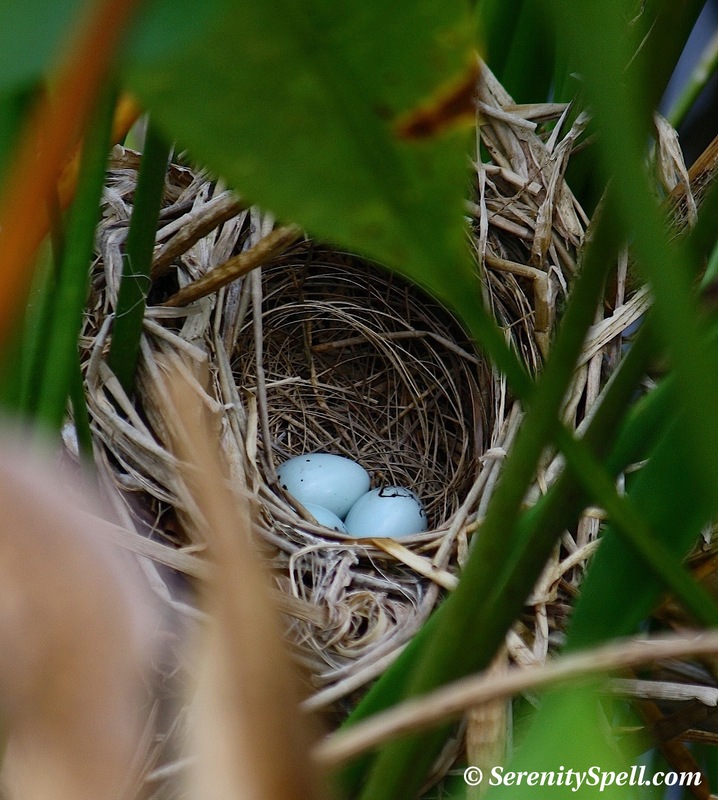 This clutch consists of three eggs — typical for the species (2 to 4). 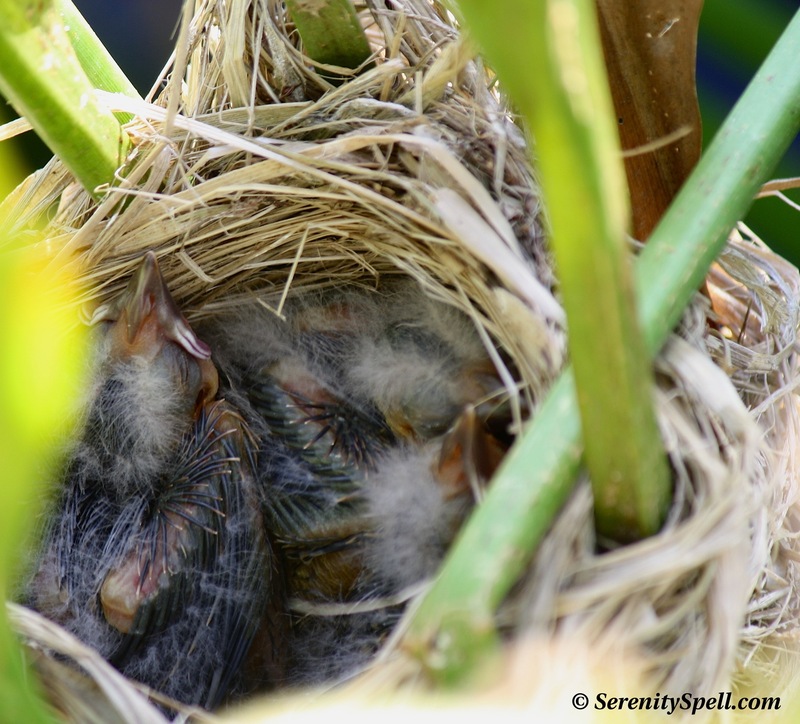 They’re oval and smooth, of a pale bluish coloring, and marked with brown and/or black markings. 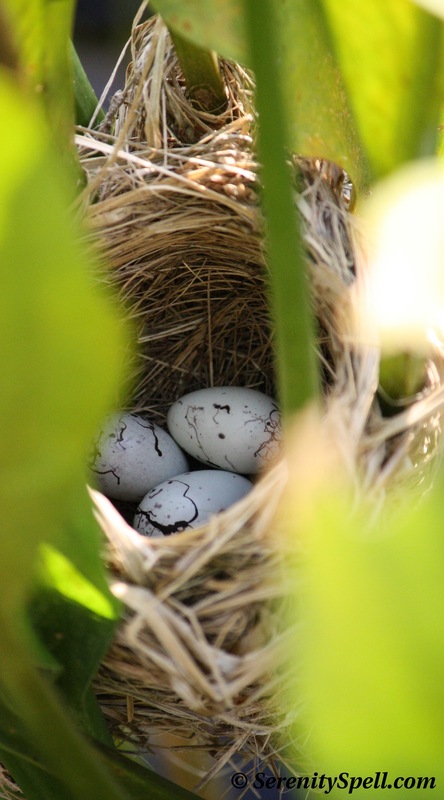 The eggs are incubated by the female alone, and will hatch within 11 to 12 days. 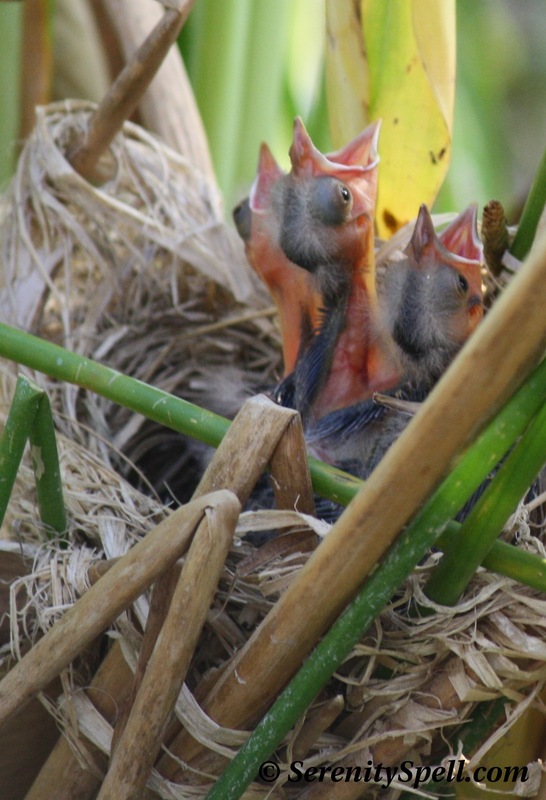 Red-winged Blackbirds are born blind and naked, but are ready to leave the nest 11 to 14 days after hatching. 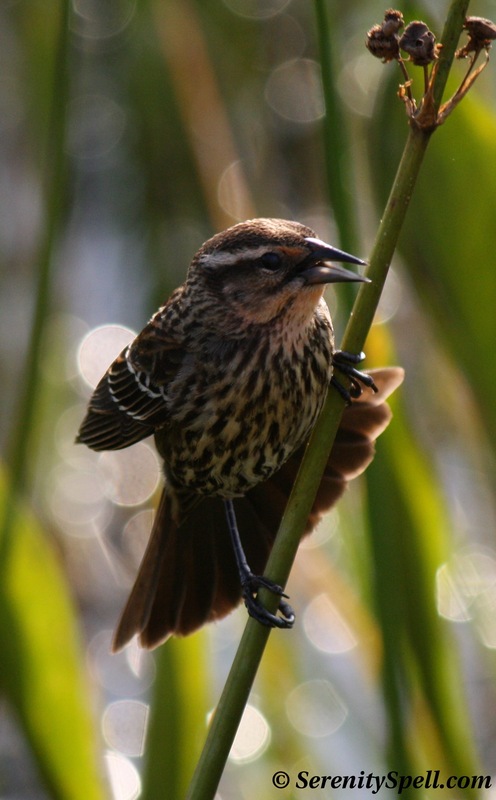 I’m lucky to have close access to the Green Cay and Wakodahatchee Wetlands (Seminole for “created waters”), and when we’re not able to hike the Everglades or some of the other far-reaching natural area, a stroll around these boardwalks will soothe my spirits. 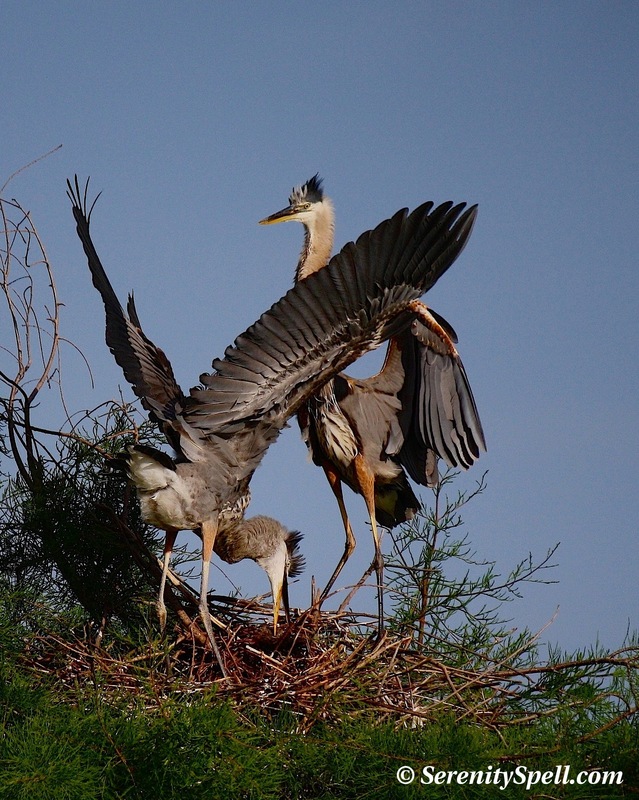 It’s full-on nesting and baby season, and while I’ve posted some pics of the anhingas and others (the baby gators I’ve yet to post), I’ve saved the biggest for last: the ever-so-graceful Great Blue Herons. 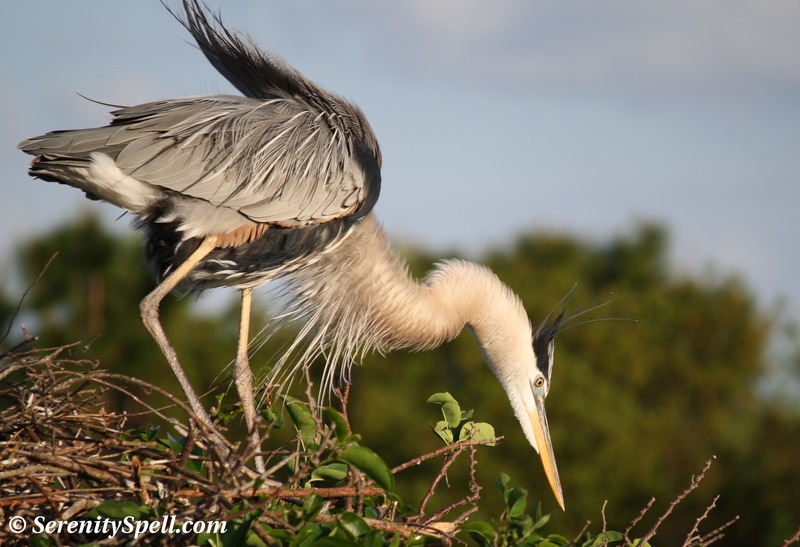 Their displays at the rookery fuel the attentions of every amateur and professional photographer and birdwatcher for miles, and the meek (*me*) have no place if it’s crowded…which is fine, because while the herons are divine, there’s plenty of other loveliness to be found when no one’s looking. 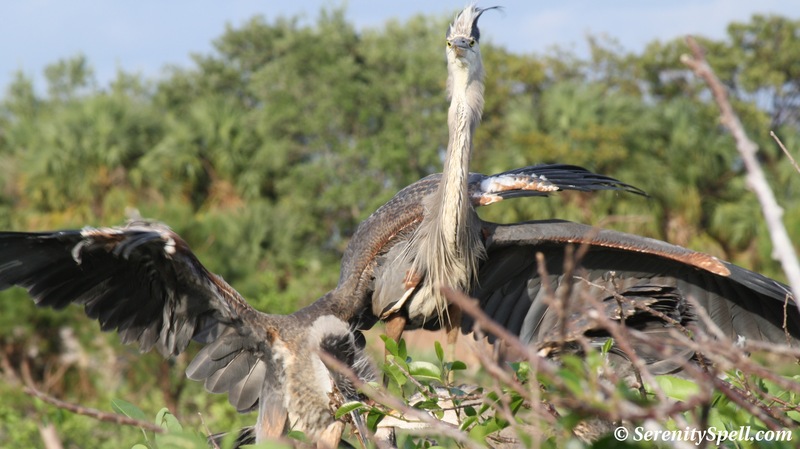 The Great Blue parents share the responsibilities of feeding their young at the nest, by hunting on a full-time schedule and regurgitating the food. 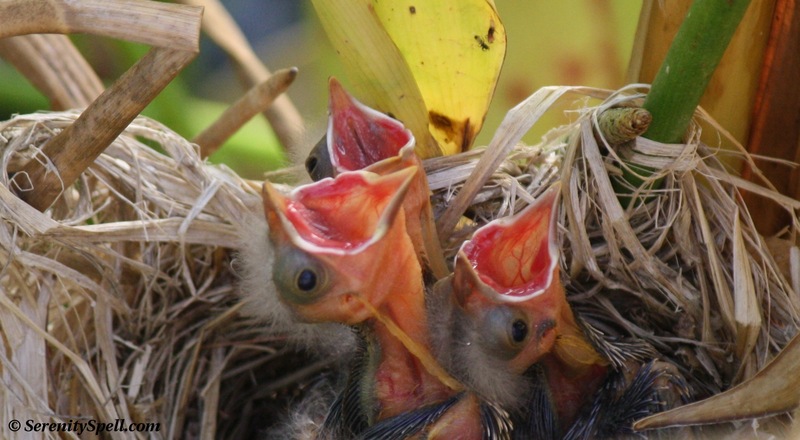 The battle for food is brutal among the chicks; the first to hatch is more experienced in food handling, and consequently grows more quickly than the others. 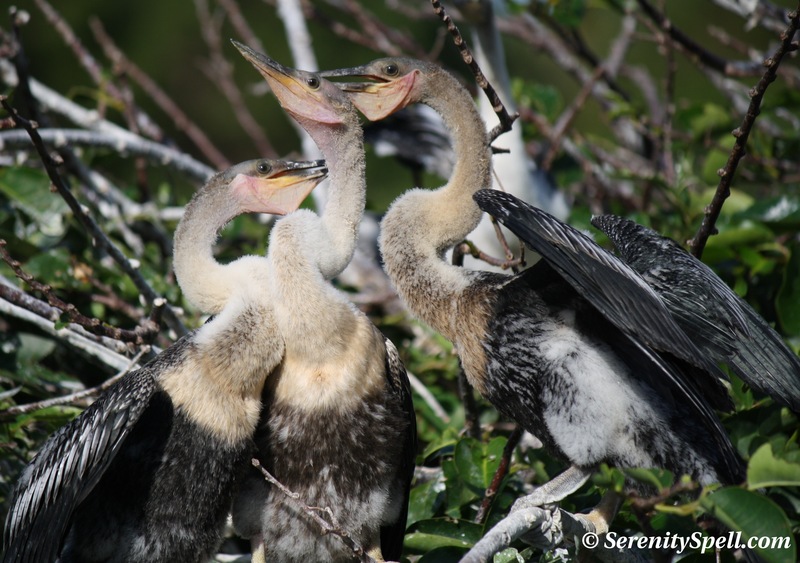 Such aggression in the interaction with the sibling chicks (as well as the discrepancy in size) can be seen at the Wakodahatchee rookeries, where the humans root for the younger, weaker chicks that consistently lose after fierce battles for food. 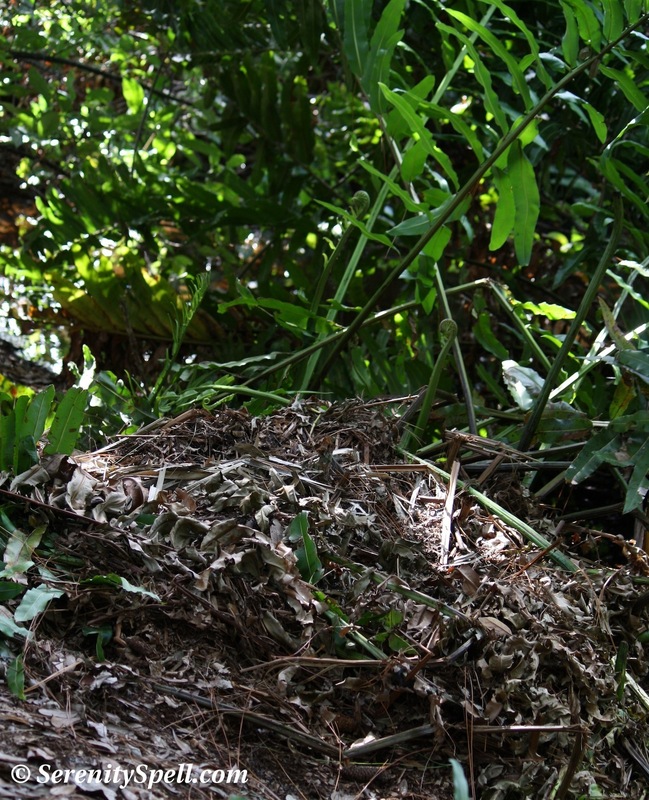 This particular nest had two young herons — there initially may have been more eggs however, because we spied an iguana lurking in the depths of the rookery, obviously looking for eggs to steal. 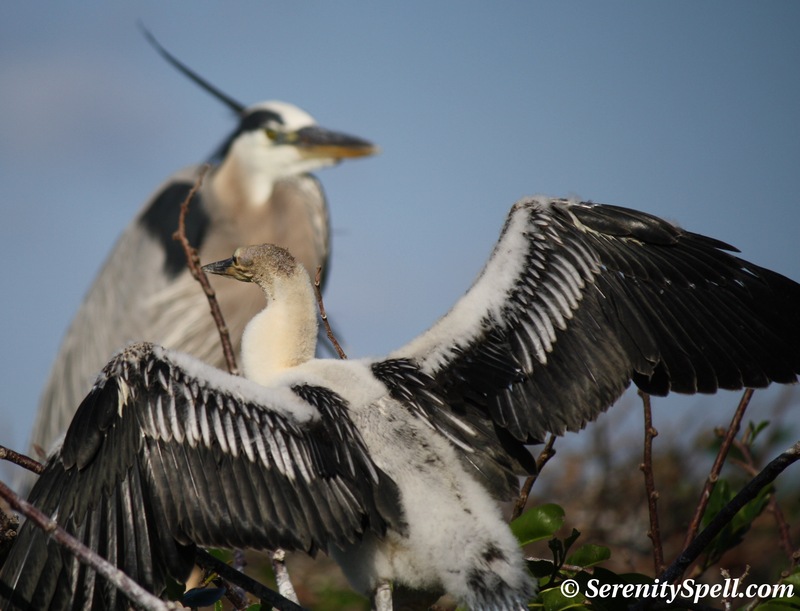 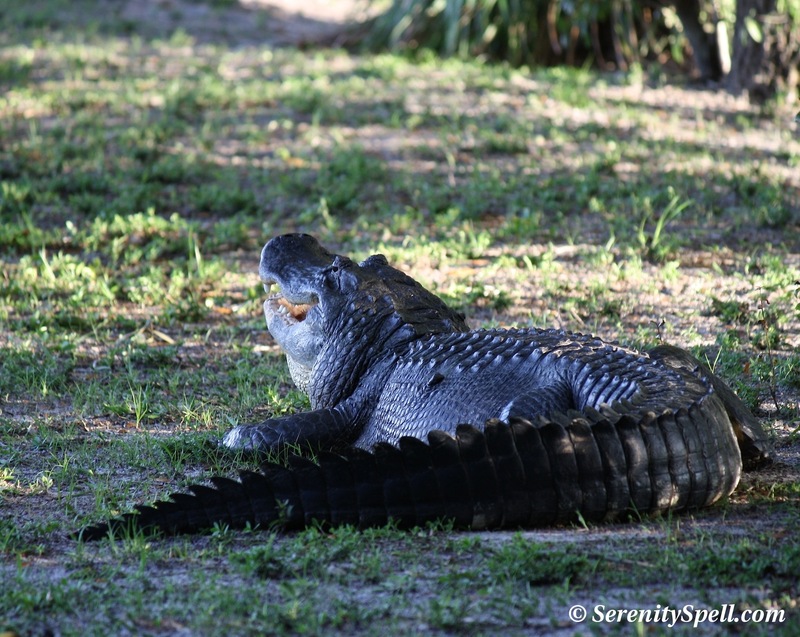 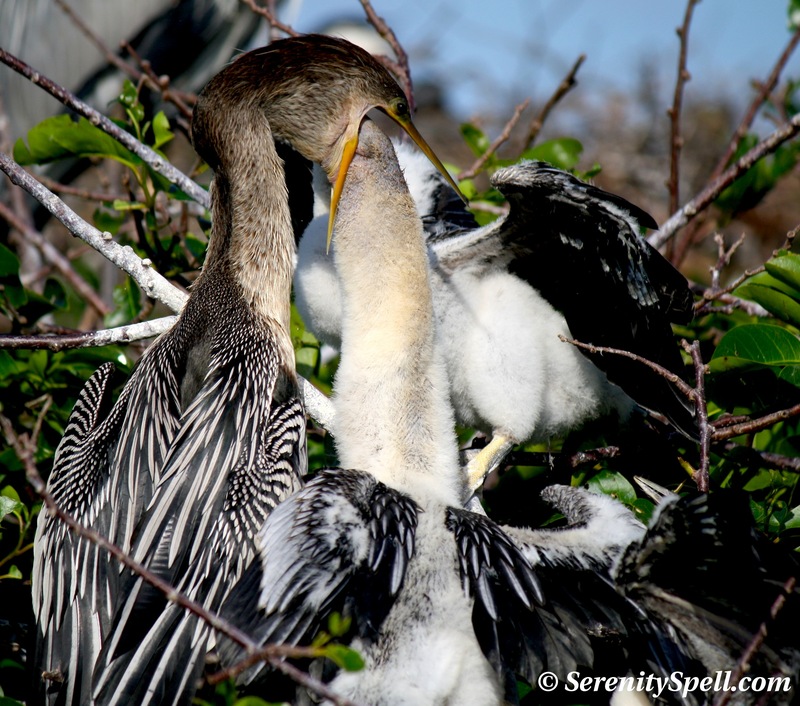 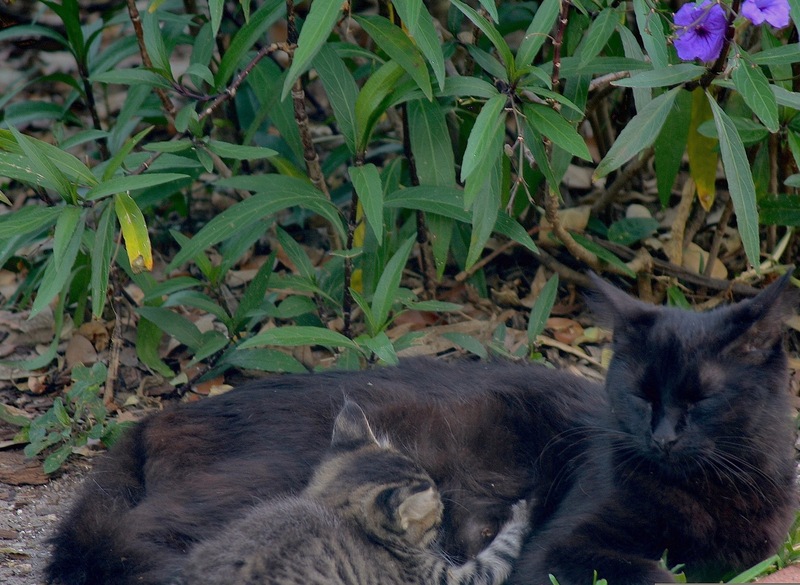 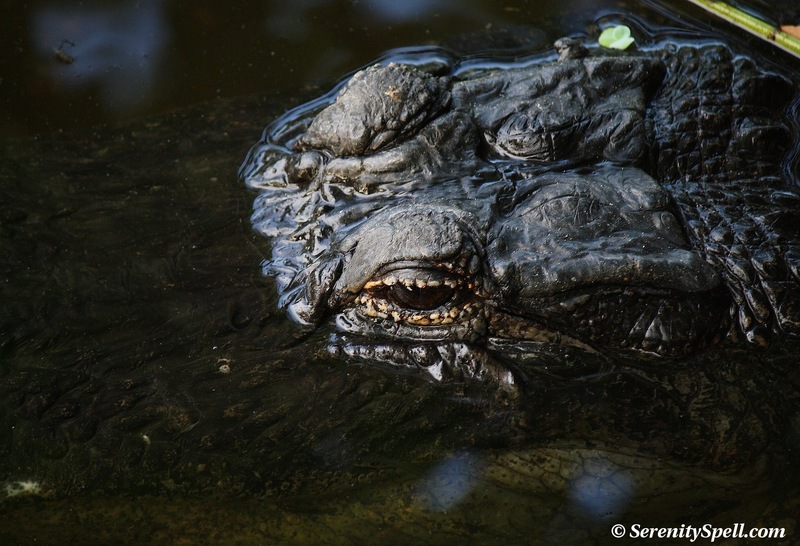 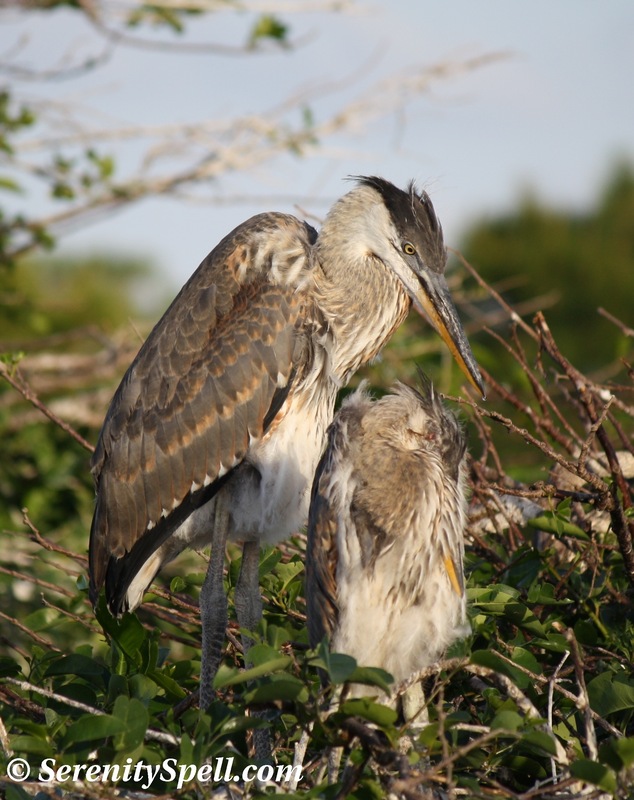 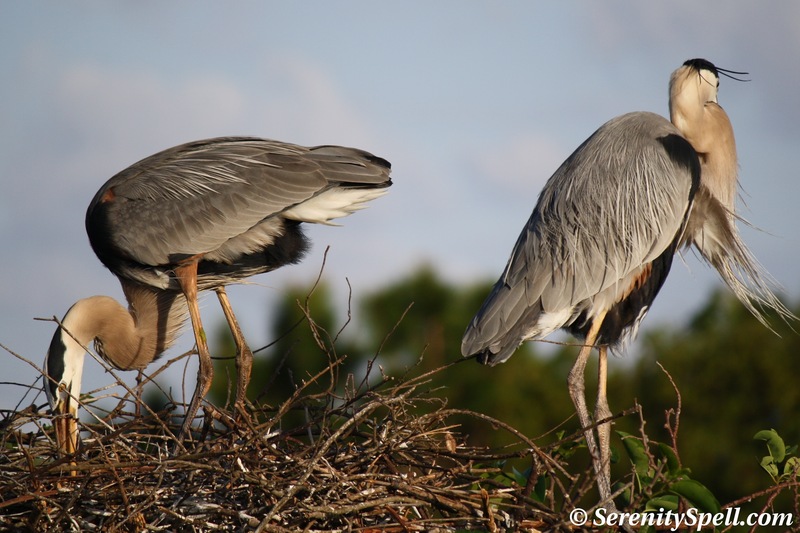 For the last two months, it’s been nesting and baby season at the Green Cay and Wakodahatchee Wetlands — oases of green in South Florida’s suburbia, nestled on the edge of the Everglades. 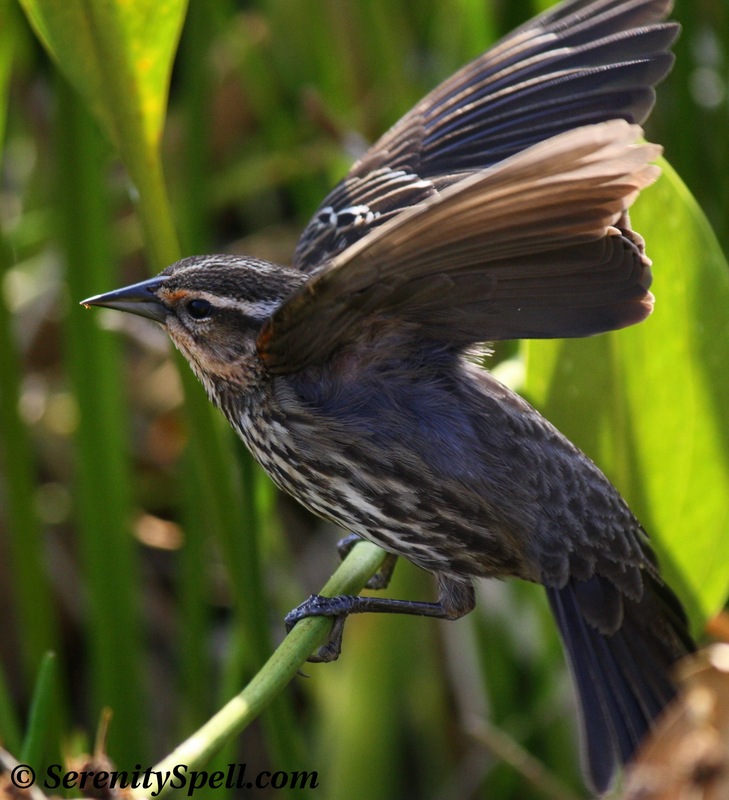 In the Seminole Indian language, Wakodahatchee translates as “created waters” — and that’s exactly what’s been done at these wetlands. 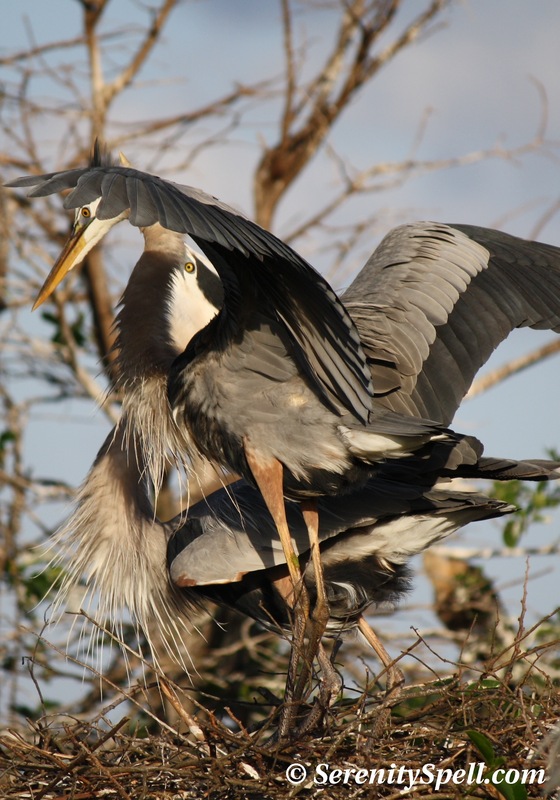 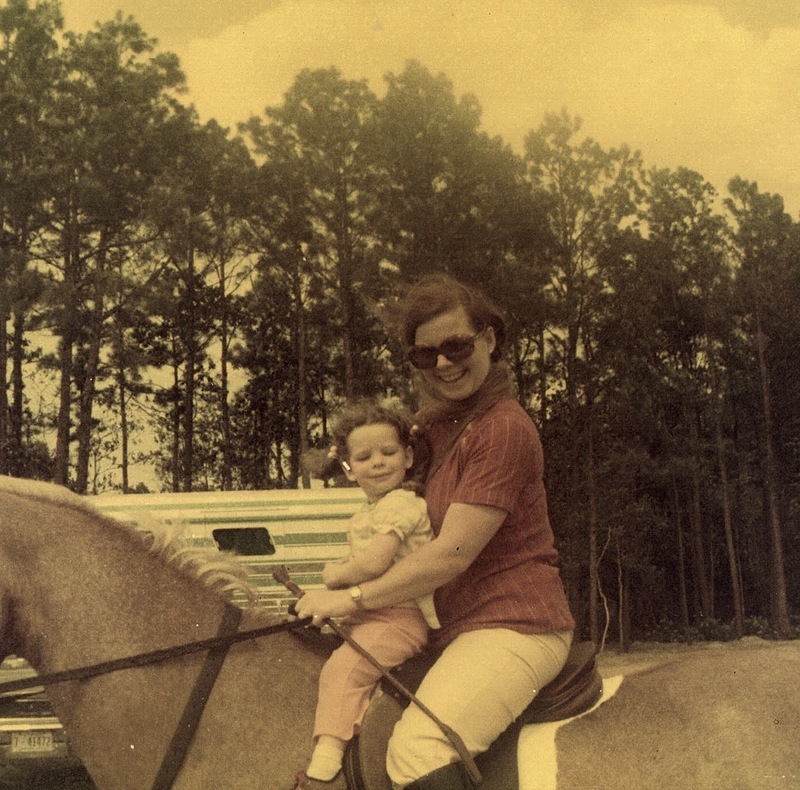 Wakodahatchee’s present-day 50 acres of wetlands were, in their previous incarnation, unused utility land. 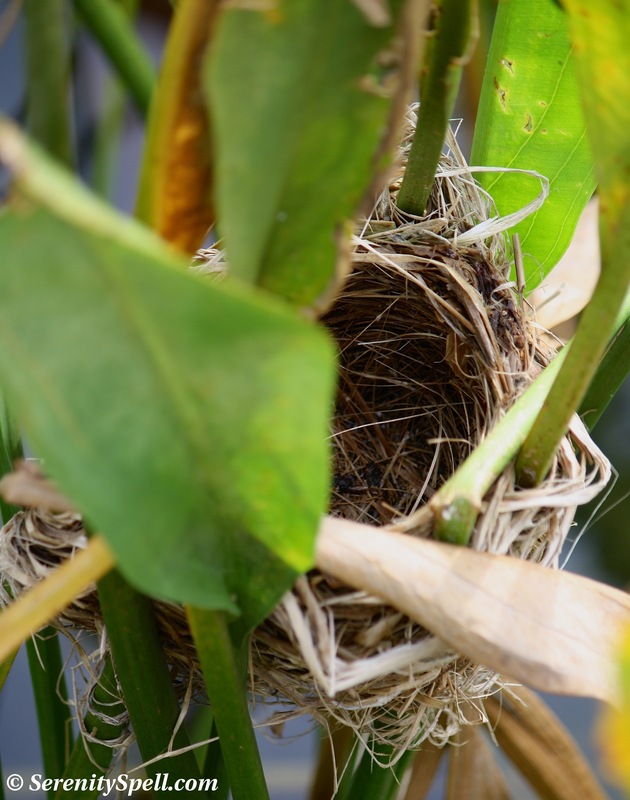 But the space has been transformed into an Everglades wildlife ecosystem, with marsh habitat, intermittent tree islands, and cypress hammocks. 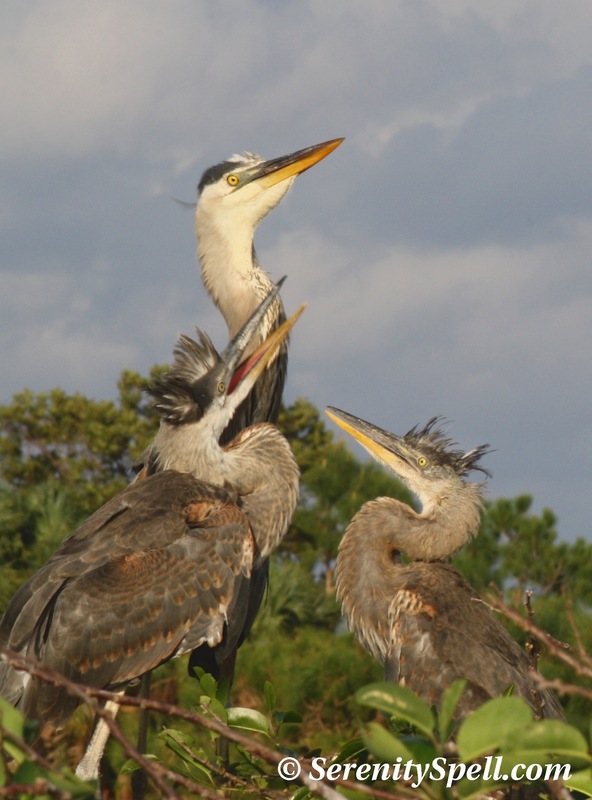 Each day, the Palm Beach County’s Southern Region Water Reclamation Facility pumps nearly two million gallons of highly treated water daily into Wakodahatchee; the wetlands themselves further naturally cleanse, recharge, and filter the remaining nutrients and maintain earth’s water cycle. 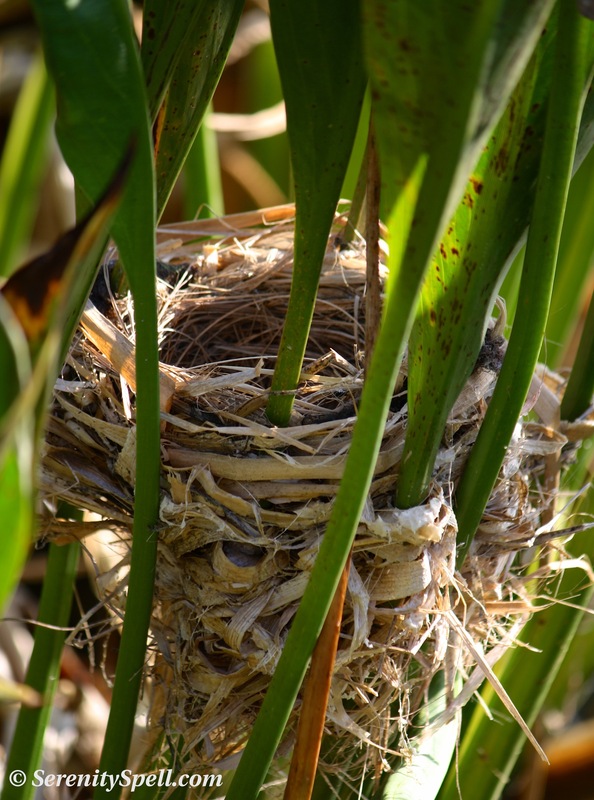 Dozens of different species of trees, shrubs, and aquatic vegetation were also incorporated to help manage this feat. 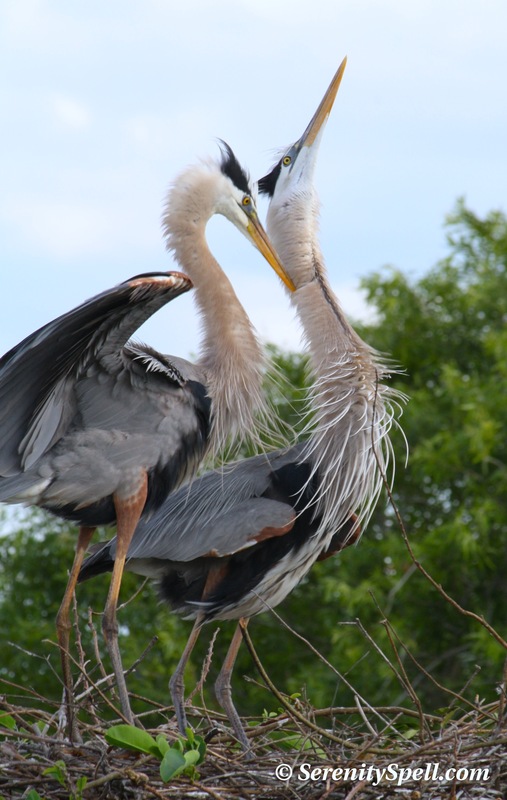 Wakodahatchee is a birdwatcher’s paradise — the site is part of the South section of the Great Florida Birding Trail, and common sightings include egrets, herons, ducks, grebes, bitterns, ibis, moorhens, warblers, blackbirds, cardinals, owls, hawks…and the list goes on, with more than 140 species identified. 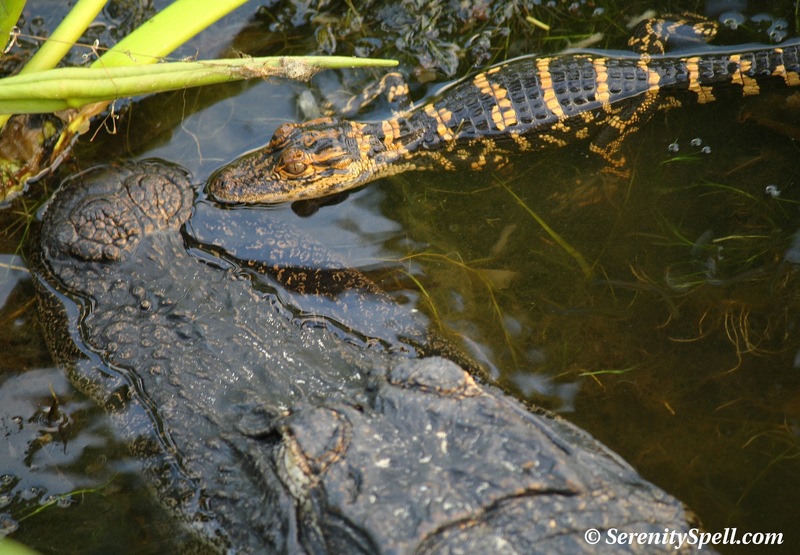 Many turtles make their home at the wetlands, and marsh rabbit can also be seen in the grassy and low-lying areas. 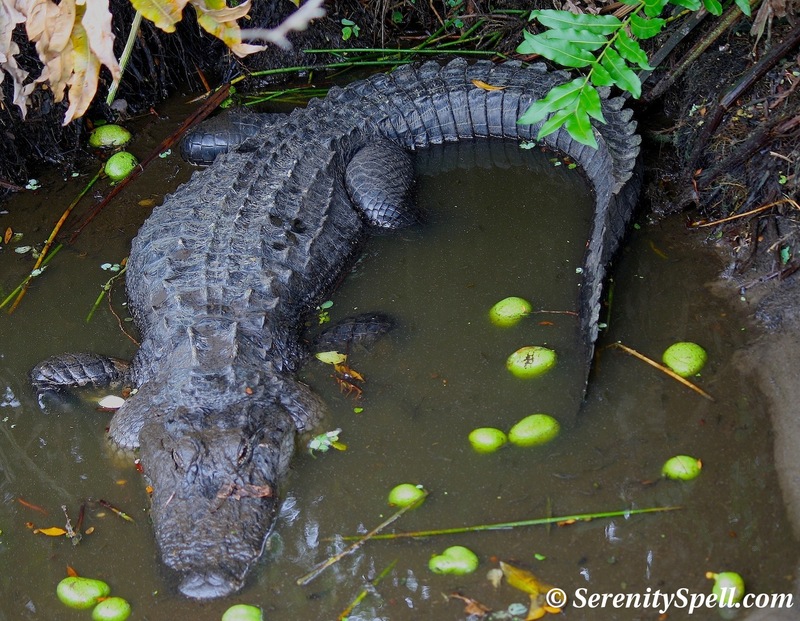 As always, alligator sightings are common at Wakodahatchee, and non-poisonous snakes and frogs live on the fringes of the boardwalk. 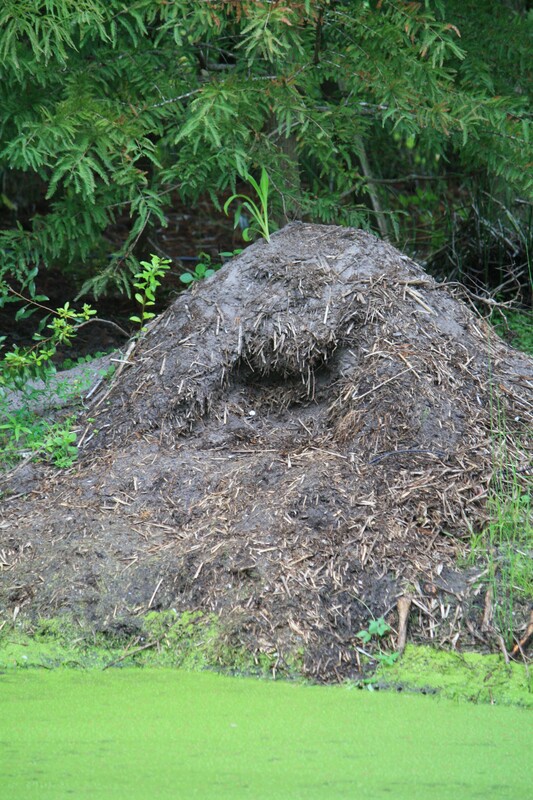 But I’ve even had the most fortunate sightings of shy otters and bobcat. 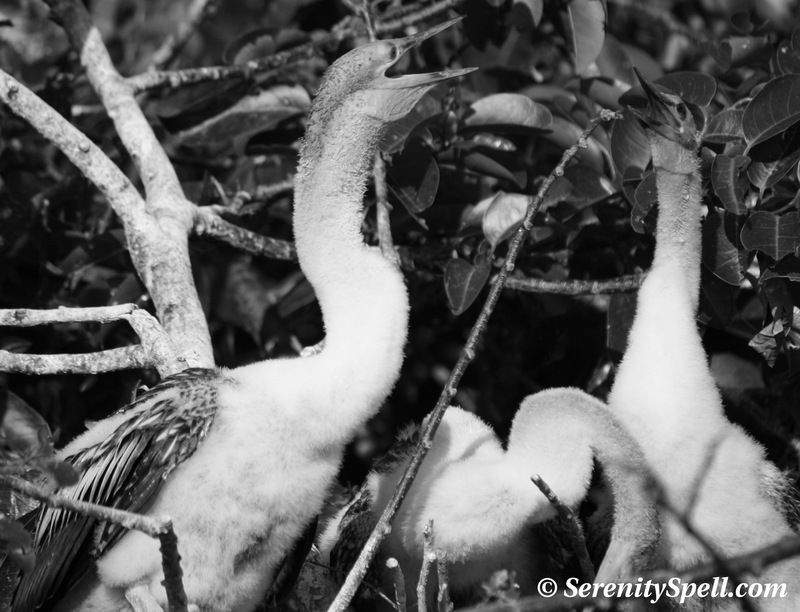 Right now however, it’s the babies that are catching everyone’s eyes….